Chanis Fernando Boisard was born in Sri Lanka, where she spent her childhood and adolescence. She then went on to Paris to study modern languages at Sorbonne University. During this time, she spent summer vacations with her parents in Mogadiscio, Somalia, where her father had taken up an assignment. She joined American Airlines in 1991 before moving to Sri Lankan Airlines where she was in-charge of group travel until December, 2015. Chanis won the British Council Short Story Competition in Colombo in 1976 for her story, The Ayah, and has written a great many stories since then. During her 26 years in the airline world, she was able to visit many countries including Borneo, Argentina and Iceland. Her frequent visits back to her home country shaped her sharp sense of observation and sensitivity. She could step back and see Sri Lanka differently, both as a native and as someone who had spent more than half her life away. 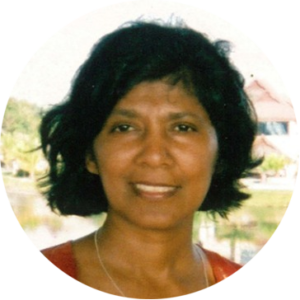 Chanis enjoys learning new languages and is fluent in Sinhala, English, French and Spanish, in addition to a smattering of Chinese and Portuguese. She plays the Brazilian guitar and sings with a group of 15 musicians. She lives in Paris with her French husband, and is the mother of two daughters. The book can be ordered directly from Gardners in the UK.